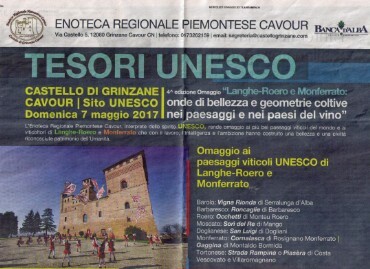 May 7, 2017 - The Piemontese Cavour Region Enoteca, interpreter of the UNESCO spirit, pays tribute to the most beautiful vineyards in the world and to the wine-growers of Langhe-Roero and Monferrato who with work, intelligence and ambition have built a beauty And a recognized civilization of humanity. 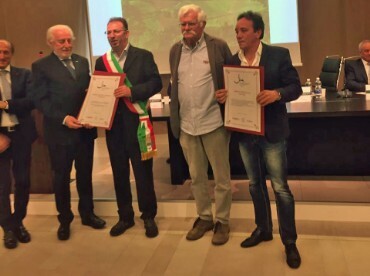 Rewarded the Moscato "Sister of the King" of the Degiorgis Sergio company of Mango. 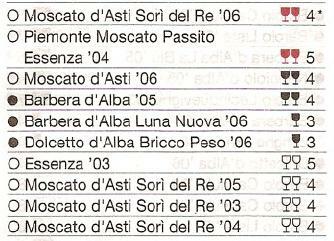 Again this year's levels are much more, for Moscato d'Asti, Moscato Passito Essenza, Barbera d'Alba. History and literature have placed Mango on the myth. The farm, directly owned by Sergio Degiorgis, owns vineyards that produce native vineyards of Moscato, Dolcetto and Barbera. The Essence, the Moscato Passito empireo, whose vineyards are at 520 meters altitude, is excellent as Moscato d Asti. 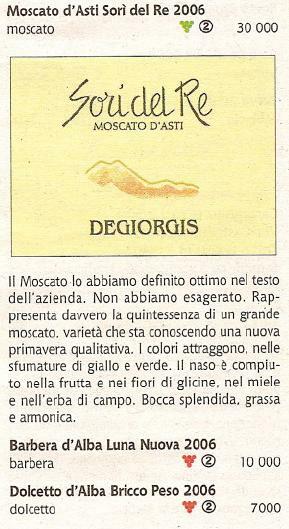 We are in the realm of Moscato, and Sergio Degiorgis is the most prominent interpreter of this vine. Your company can count on the vineyards with excellent exposure and high-quality equipment to ensure the best attention to the raw material. The prize went to the Sorin of the King, with a label, because it was considered great and represents the quintessence of a great muscat. Sergio Degiorgis continues on the road of quality from their 10 acres, with a production of 60 thousand total bottles. There is no continuous investment, since this year the company has acquired an innovative vacuum press, which guarantees the aroma of their products. Even this year, their production is always very high. The winery of Sergio Degiorgis is immediately coming to Mango and, the company develops on 10 hectares overall, in the best areas of Mango territory. One is the Cascina del Re, where it is named one of Moscati's most interesting and the second is the Cascina di Riella. The yield per hectare is low and the old vineyards and altitude make the rest, creating an intense and complex musk of exotic fruit and aromatic herbs. Essence adds exotic notes and in the mouth is fat with good nasal sensations. Despite the difficult vintage for the ages, since the 2003 vintage was very hot and with no thermal excitement the night, Sergio and Patrizia Degiorgis were able to get a Sori 'of the King of very good quality, and very good Essence and Dolcetto of Aba. The Degiorgis cup is confirmed. A Barbera d'Alba 2001 revealing a valuable Cassis menta of Bordeaux, a Bricco Pescado Dolcetto d'Alba 2002 crisp despite the vintage, a toasted Riella 2001. A glass that is now close to the fruit. Good.